Inspired by couture style and chic designs, this Ivory Pearl and Champagne beaded salad serving set brings elegance to the dinner table. Serve your guests with some luxury couture style entertaining. Great gift idea for anyone who is chic and classy! This is a MADE TO ORDER ITEM. Bead placement will vary slightly. 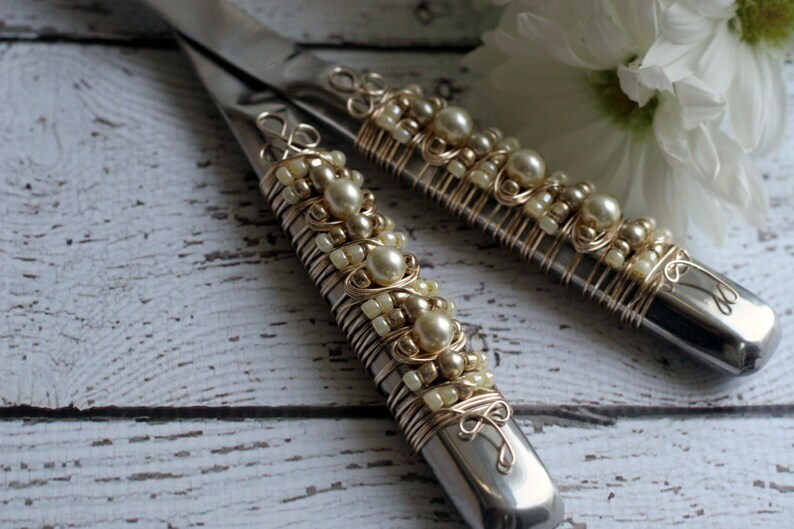 I use a non-tarnishing gold wire and a variety of ivory pearl and champagne pearl beads. I use restaurant grade stainless steel serving ware. Sold as a set of 2. Dimensions: Both pieces are approx. 12 1/2" in length.